As the Breeders’ Cup draws closer and closer, the racing just gets better and better. Below is a look at a couple of races at Keeneland with Breeders’ Cup implications on Saturday, followed by in-depth analysis of Sunday’s Prix de l'Arc de Triomphe. After getting back into the winner’s circle last time at Presque Isle Downs, GROUPIE DOLL looks to repeat in a race that last year served as a springboard to her win in the BC Filly & Mare Sprint. The daughter of Bowman’s Band is four-of-five on all-weather surfaces and will be tough to beat; however, she’s also likely to be overbet, especially to show. Hence, I’d try to beat her in the show pool with GYPSY ROBIN (primarily) and PURELY HOT. Play those two to show id Groupie Doll controls more than 75 percent of the show pool. Similar to race 6, the ninth event at Keeneland on Saturday, the Grade I Shadwell Turf Mile, features a strong favorite. Wise Dan, the defending Horse of the Year, has looked invincible in recent starts but, like Groupie Doll, I think there’s a very good chance he will get overbet in his final prep prior to the Breeders’ Cup. Again, I would take a shot at beating him in what is sure to be a large negative show pool. In this case, smaller bets on SILVER MAX, WINNING PRIZE and COALPORT seem in order. And remember: When you bet into a negative show pool, the goal is to break even or lose a little bit when the big favorite hits the board and cash big on those rare occasions when he/she runs out. The Prix de l'Arc de Triomphe is arguably the greatest turf race — heck, the greatest race, period — in the world. And this year’s edition shows why. There are entrants from England, Ireland, France, Japan, Germany and even Argentina. * 20 of the past 25 Arc winners also won their last race. * 2 of the past 25 Arc winners finished second in their last race. * 2 of the past 25 Arc winners finished third in their last race. 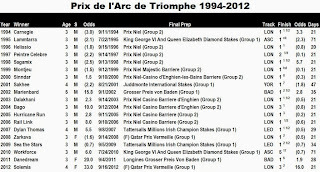 * Since 1988, 17 three-year-olds have captured the Arc. 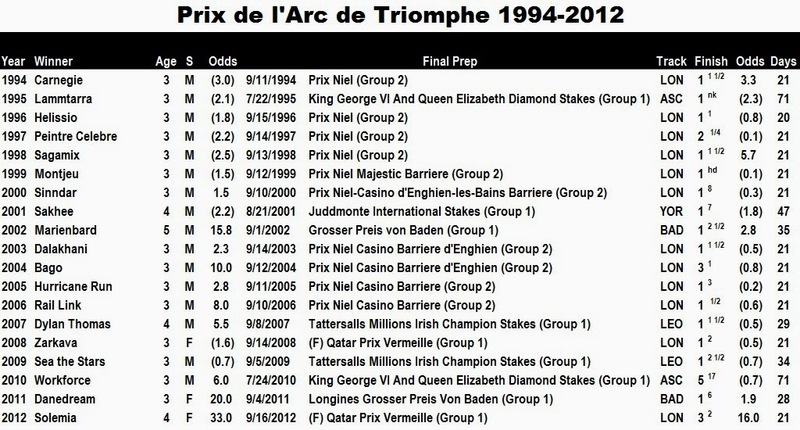 * Favorites have won 9 of the past 22 editions of the Arc in which the final odds were available. * 14 Arc winners since 1988 were favored in their last race. Considering both the likely odds and recent trends, I’m most intrigued by LEADING LIGHT and INTELLO, although KIZUNA, TREVE, AL KAZEEM and PENGLAI PAVILION will be on my exotics tickets as well. I have Al Kazeem at a much shorter number. In the 5/1 to 7/1 range. His jock is an up and coming star. I think Al Kazeem could be a decent overlay; gonna be a fun race.